Going through diagnostic medical imaging operations can be a terrifying experience, especially when searching for possible bad news. Americans often report high levels of anxiety when undergoing imaging services for a wide range of reasons. When it comes to children, though, the process becomes more delicate. Modern medicine recognizes that kids are not adults, and therefore are not able to comprehend a number of complex procedures and diagnoses. North Pittsburgh Imaging Specialists is here to provide comprehensive pediatric imaging to children in need across the state. We proudly provide Pittsburgh patients with imaging services that are professional and affordable. Finding quality imaging can be a challenge for parents wanting the best for their children, especially when restricted by high deductibles or low coverage amounts. Today, we’ll highlight a few benefits that our imaging center provides pediatric patients to create the best experience for children going through big challenges. Be sure to contact us today to learn more about our affordable imaging services. Imaging services can be intimidating for full-grown adults, let alone children who are frightened at the whirlwind of medical services in their lives. Our radiologists strive to provide a calm and comforting setting for your little one, providing age-appropriate support to create a positive outcome that minimizes fear and discomfort. Medical imaging is seen as cold and calculated, but our practice aims to be warm and comforting instead. When you visit our Pittsburgh clinic, you’ll see first-hand how much care is put into making our imaging services safe and comforting for patients of all ages. Every member of our team strives to deliver the highest level of care for each patient, taking the time to explain procedures and answer any questions. Kids are curious by nature, making it valuable to find radiologists who can provide comfort and support through comprehensive knowledge of the process. This can help you as the parent as well, as you’re likely to have numerous inquiries to ensure the best care for your little one. Childhood anatomy varies from adulthood, making it important to have knowledgeable staff members on site to provide expert guidance and control for the best outcomes. The process of maturing into adulthood comes with a wide range of possible diseases and disorders, making it important to specialize in the pediatrics for true quality in care. Radiology provides a very beneficial service, but it does have concerns that need to be mitigated. Children are not able to withstand the same levels of radiation as adults, making it essential to finding medical and diagnostic imaging services that focus on healthful outcomes first. Our certified radiologists are here and ready to create a plan for your little one that provides the best imaging with the least exposure to radiation. 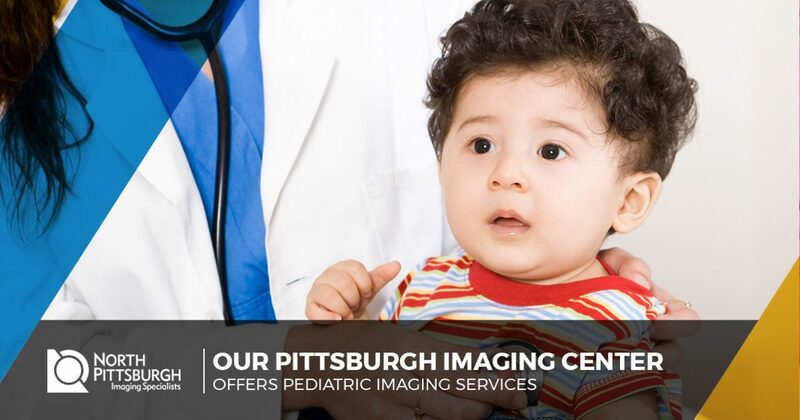 North Pittsburgh Imaging Specialists will work hard to provide affordable imaging that is as safe and as comprehensive as possible to minimize any negative effects on your child. Going into an MRI machine as a child can be intimidating, which is why our staff works with the parents to create a comforting environment. North Pittsburgh Imaging Specialists aims to deliver a positive experience for the entire family, providing comfort and support for those dealing with the stress of the unknown. If you’re looking for pediatric imaging services in Pittsburgh, be sure to contact our center for pricing and information!